One of the keys to living a relaxed, productive life is organizing your closet space. When your belongings are not where you need them to be (and where you know you can find them) it creates stress, frustration, and can make you run late. If you are looking all over your apartment for an umbrella when you walk out the door on a rainy day, you’ve misplaced your keys, or you can’t remember where you put the scissors when you get a package in the mail, it creates inefficiency and lost time. The secret to keeping track of things lies in the way you organize these things for daily life. You will feel more organized once you master the correct use of closet space, whether it’s an armoire in a small apartment or a large walk-in closet in a sprawling home in the suburbs. Getting your closets organized is also a great way to eliminate stress, find items to donate to charity, and assess your storage needs. Once your closets are organized, you’ll find that your mornings run more smoothly and you can enjoy your possessions without fretting over where things are. These are the key elements of closet organization, culled from dozens of household organizing experts. Within a few weeks you will have a much more organized house and a less stressful daily routine. Do not try to organize several areas at once. Focus on one at a time whether it is one per month one per week or one per day if you have just moved into a home. If it is a hall closet designed for coats and boots, do not to store things you don’t actually need on the way out the door. You will have to just push past art supplies or folding chairs to get to the things you really need each day. You can toss out items you don’t need, donate them to charity, or pass them along to a friend who could use them. Having extra items in your closet means you’re wasting time every time you sift through things to find what you need. The fewer the belongings in your closet, the easier it will be to find everything you need. Here is the best strategy for sorting through your belongings in a closet. Get four laundry baskets or large boxes. Label one “Keep/Storage,” one “Put Away in Closet,” one “Throw Away,” and one “Donate to Charity.” Sort out everything in your closet. Put stored items in another area of the house or in a climate-controlled storage unit. When you’re done, you’ll have a much cleaner and more spacious closet, and a more uncluttered mind. Clear storage bins allow for easy viewing of contents and save time rifling through boxes. Over-the-door pocket shoe organizers are great for a variety of items, not just shoes! 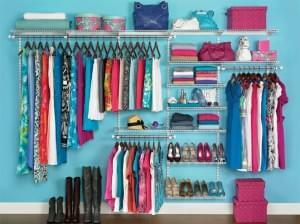 Plastic or wire storage shelves and racks are an easy way to add more shelving to closets. Tension shower rods that are sturdy can be a great way to add more “hanging” space. Hanging drawer organizers can keep small things collected and easy to find. Most closets have a hanging rack that only utilizes about a third of the available space, unless you are hanging full-length dresses or coats. Use Storage cubes for shoes stacked on the floor, install a shelf if it would be helpful, and add a second hanging rack if needed because that will double your hanging space. Use the space on the back of the closet door. An over-the-door hanging hook can be a perfect spot for hanging jackets, belts, scarves, purses, hats, bathrobes, or other items. Also consider using a hanging shoe rack organizer on the back of your closet door to make floor space in your closet for other necessary items. Many people find that climate-controlled self-storage is a good solution to small or cramped close space. If spending a few extra dollars a month would give you 200 extra square feet of living space that is currently being used to store your storage, it’s usually worth it. Contact Value Store It to reserve your new storage spot and find the extra closet space you’ve been looking for. We have several self storage locations throughout Florida and Massachusetts, for your convenience.